Though stereotypes suggest that expats stick together, data from the Expat Insider study reveals that those living abroad are integrating with local residents and expats alike to form an international community of friends. Thanks to Internations' Expat Insider 2017 study, you can find out where expats are the most, and least, likely to be friends with local residents and discover the potential reasons for this in the following infographic. Survey statistics suggest that the “expat bubble” stereotype might be outdated: only a third (33%) are mostly friends with other expats, while 19% count mainly locals as their friends. The majority of respondents (48%) says that their social circle is a mix of locals and expats. Men are slightly more likely to make friends with local residents: 22% say that the majority of their friends are locals in comparison to 17% of women. 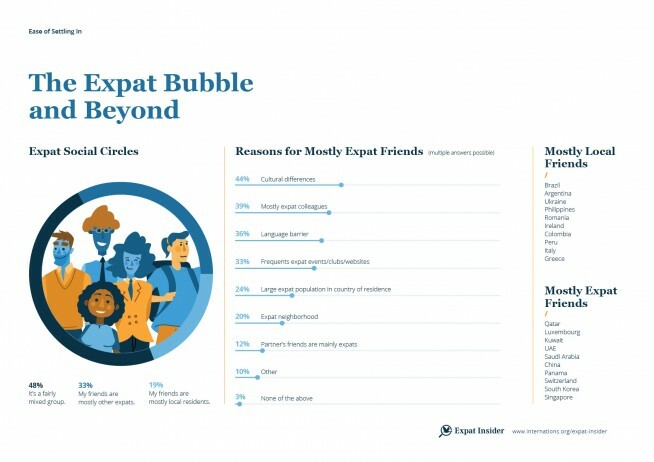 Expats age 26–35 are most likely to stay in the bubble (two out of five are mostly friends with other expatriates), while those over 51 are more likely to have local friends (27% vs. 19% across all age groups); this might be linked to the fact that two-fifths of them have already lived in their current country of residence for more than ten years. For those who said their friends are mostly expats, the main things holding them back from making local friends are cultural issues (44%), the language barrier (36%), and having mostly expat colleagues (39%). Interestingly, language skills are mainly an issue for expats under 30 (mentioned by up to 44% in this age group). - The majority (48%) says their social circle is a mix of expats and locals. - Men and expats over age 51 are more likely to have local friends. - Almost three in ten (28%) had friends or family already living in their destination. - Those living in the Gulf States are most likely to stay in the expat bubble. Are you living in an Expat bubble?